There are various opinions out there regarding what is the definition of Street Photography. Purists insist that a true street photo has to be a candid shot of a person or persons going about their everyday lives in the public domain. For those purist a staged portrait would not count as Street Photography. For me (as well as for many others) Street Photography is everything that documents how life looks like in a given moment in time. If it weren’t for Street Photography, how would we know today how everyday life looked in the times of our grandparents and even parents. Photojournalism covers mainly events of some sort, then there is Fine Art Photography, Landscape Photography etc.., but only through the open field of Street Photography we can get a feeling today how our forefathers (and -mothers…) dressed, interacted with each other, how buildings and streets looked in that time, what kind of advertisement and business existed and so on. So through Street Photography we know how society looked when we ourselves weren’t there to see for ourselves, or how different people, societies and cultures look today in places that we have no chance to visit ourselves. And that includes all kinds of shots and motives. Not only candid portraits, but for sure also staged shots, shots of street live, shots of urban landscape and architecture. And so this is the value add that street photographers bring into society, we document how life looks today and preserve that for the future. After all, what we see and experience today is already history tomorrow. And so Street Photography in the wider sense with all its aspects is a legit and needed art form. And considering this it is difficult to understand why our genre is getting so much push back and harassment these days. Because I’m sure that all this opponents of us street photographers also like to look at old B&W picture books describing how life looked 50 years ago. So I’m absolutely ok with staged street portraits. The guy I in the photo above was really passionate in his guitar play. Somewhat ZZ-Top like he put on an awesome show trying to earn some cash from the passerby’s. Many stopped and listened, but almost no-one threw some change in the guitar case. So I dropped a silver coin in the case, smiled at him an waved with my iPhone (didn’t have any “legit” cam with me). And for sure he smiled back and put on some extra guitar hero moves in my direction. 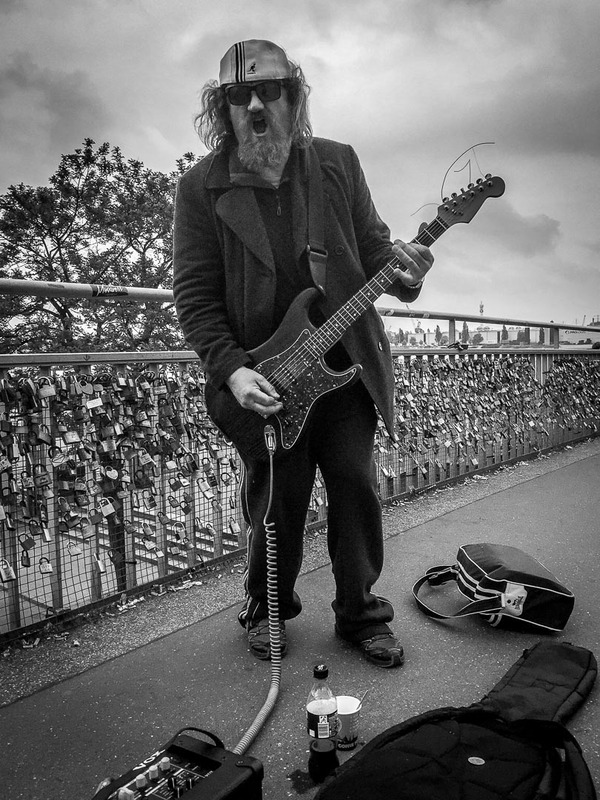 I was happy, he was cool with it and even it was a staged shot it shows how a Rock’n Roll Street Musician looked like in 2016. As to the “pushback” some are feeling, the short answer probably has to simply do with a combination of how many cameras are out in public these days coupled with the infinite number of ways photos made by those cameras can be shared. That’s something that didn’t exist 50 years ago, 10 years ago, or even five years ago. As to your question: more often than not, I do leave some change for a street performer whose photo I take. It’s got less to do with street photography ‘ethics’ or ‘cred’ than simply with some common decency. Thanks for your visit and your thoughts, Bob! You also have spme very good points there! I totally agree with your definition of what qualifies as being a “street photograph.” While I always strive for a candid shot, so as not to impact what is transpiring in the scene, likewise – I never pass up a busker and agree that tossing something into the case/cup/hat/etc is always a good idea.